GEOKON offers a wide variety of options for monitoring groundwater, lake and stream levels. Products range from simple standpipe piezometers and water level meters, to downhole water level loggers and pressure transducers connected to dataloggers for pump tests and real time monitoring. Sensors for measurements in streams and weirs are also available, along with low-power data acquisition systems to wirelessly collect data from many sensors spread over a wide area. Valarm remote monitoring systems have been deployed near levees and the Feather River in central California, north of Sacramento, for early warning and community safety. 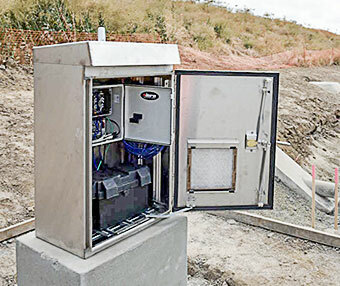 The systems comprise GEOKON 4500S Vibrating Wire Piezometers, GEOKON LC-2 and LC-2×4 Dataloggers interfaced with Yoctopuce sensors hubs using Ting GSM cell networks, powered by deep cycle, sealed lead acid (SLA) marine batteries. Measurements are uploaded at user defined intervals to Tools.Valarm.net for analysis and visualization in data tables, on maps, 3D earth globes, graphs, historizers, and web dashboards. These remote monitoring deployments are part of a California government project which utilizes the expertise of agencies and organizations like Wood Rodgers, Inc. environmental engineering consultants, Jensen Drilling Company, HDR, Teichert Construction Company, and the California Department of Water Resources (DWR) to integrate GEOKON vibrating wire sensors with Valarm Tools Industrial IoT software. For additional information, please visit the Valarm blog.